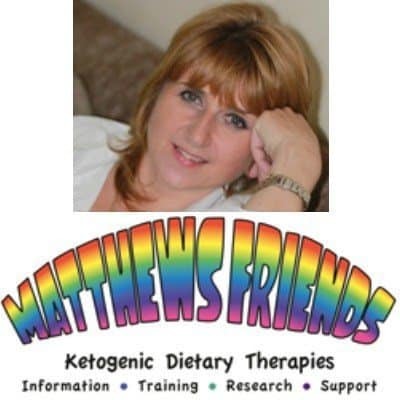 In todays interview I get to speak with ketogenic diet for epilepsy campaigner, Emma Williams from Matthews Friends about the benefits of using the ketogenic diet to help manage epileptic seizures in both adults and children. Emma is very passionate about the power of a keto diet to epilepsy as her own son, Matthew, is the reason she founded the charity support organisation, Matthews Friends in the UK. She was recognised for her work with an MBE from Her Majesty the Queen in 2013. I have always been interested in how ketones can help our brains heal and work better. Hearing how a low carb high fat diet helps children with epilepsy reduce their medication and even have a chance to not need anti-convulsant medication was my main reason for starting my Bulletproof coffee self-experiment. Emma shares some great advise on how parents can speak with their neurologist or doctor about starting a ketogenic diet for therapeutic reasons. If you know someone who is epileptic and has trouble managing their seizures then have them listen to Emma. She helps to explain how powerful the ketogenic diet results can be within weeks to months of starting. I also discuss with Emma the common issues of doctors not thinking of prescribing a keto diet as a first line conjunctive treatment along with the medication, but how their is a support system in the form of Matthews Friends website information materials, telephone support line and clinics. Special thanks to Emma for joining me on the show. Enjoy the episode! Go to the Matthews Friends website to find out more about the charity, like their Facebook page & check out their free ketogenic diet recipe ideas on the Youtube channel. [0:31] – Introducing Emma and Matthew, who the organisation Matthew’s Friends is named after. [4:30] – Figures show that approx. two thirds of children with intractable epilepsy that go on this diet will have a 50% or greater reduction in their seizures, which is equivalent to any new anti-epileptic drug available. [5:03] – How well is this accepted within the medical community; will doctors generally refer their patients to an organisation such as Matthew’s Friends? How Professor Cross’ trial proving the efficacy of the diet changed things; hospitals and NHS centres couldn’t ignore proven clinical research. [6:33] – Professor Cross’ trial started in 2004, but people only started to take note in 2008 when the results were published; Emma tells us how Matthew’s Friends worked with Professor Cross and other medical professionals to spread awareness in the interim. [7:38] – Today most tertiary paediatric centres in the U.K offer some kind of dietetic/ketogenic time, there is somewhere across country that most children could get referred to. Situation is better, but there is room for improvement. 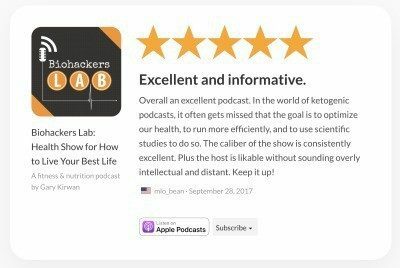 [9:37] – Talking about how most medical professionals recommending low carb diet – approaching diet as a therapeutic base rather than as a last resort – fight similar battles. Dr. Gary Fettke (who we have interviewed previously), or Professor Tim Noakes (whose book Real Meal Revolution available on Amazon is a recommended read by Matthew’s friends) are great examples of this. people with medical conditions that need management when going on extreme low carb diets. Explaining there is a difference between healthy people wanting to improve their diets generally by cutting out sugar and starchy carbs and changing diets for management of chronic conditions and extremely low carb diets. [11:43] – Talking about how Matthew’s Friends can help. Their three branches are: the Charity funds clinical research and new centres within the NHS as well as supporting all families (children and adults) going through the diet (fine tuned to the individual) by providing literature, shopping guides, recipes, support lines and other helpful resources; the Clinic with dieticians and neurologist who manage these diets for both children and adults is available where there is no local service – part of the clinic is charity funded and looking at research into new areas e.g. brain tumour treatment; and finally the Educational – the Keto College providing training. [15:50] – Emma talks about where she draws her inspiration from and how it’s not only seeing how her own son’s life has changed drastically but hearing so many stories of other patients lives improving that drives her – as well as the rest of the team. [17:02] – Matthew saw improvement within two weeks of changing his diet. How quickly do we see improvement with adults? It depends on how many medications people are on. Some people are on as many as six-seven different medications so it can take a bit longer to see positive effects. Generally, a commitment of three to six months is needed. shares a story about one of their adult patients and the immense change the diet had to her life. [20:25] – If you are in the UK go to their website and look at the information there to get an idea of the diet, contact Matthew’s Friends, Emma will refer you to your local centre or you can ask your doctor where their main tertiary centre is. If no local service ask doctor to refer to Matthew’s Friends. [21:57] – There are also registered support branches internationally, in Canada and New Zealand. [23:13] – Emma talks about how currently the full ketogenic diets aren’t being used for diabetes and there is more research needed around that. Dr David Unwin, a GP in London, has been getting good results by putting his diabetic patients on low carb diets. [23:56] – Other metabolic conditions the organisation assists with includes GLUT1 deficiency syndrome where patients cannot metabolise glucose to get energy to the brain, Emma explains how GLUT1 can be mistaken for epilepsy and there are patients being mistakenly treated for epilepsy. People with this conditions has to be on the diet long-term. [25:35] – There are trials looking at ketogenic diets in conditions such as multiple sclerosis, Parkinson’s, autism, certain types of cancer and more. There is a need for clinical evidence; that’s why Matthew’s Friends are partnering up with other charities (e.g. Astro Brain Tumour Fund) and investing in clinical trials quite heavily. [26:41] – The diets are customised for individual’s personal situations. How strict does it need to be for therapeutic effect? For children dietitians would calculate this taking into account their age, height, weight, growth etc. Emma explains there are four type of diets that are used for medical treatment: classical ketogenic diet based on ratios (80-90% fat), MCT ketogenic diet worked out in percentages, modified diet with 10-20g carbs a day (Modified Atkins originated with Eric Kossoff), and in the UK this was adapted further starting with higher carbs and then bring it down to get ideal levels of ketones. [29:32] – What does a 80-90% fat look like? Emma explains how it has changed to what it used to look like. How visual shock is the biggest one; smaller amounts of food, but still same amount of calories. To get the best idea what it looks like, have a browse of some of the recipes available on the website. [31:28] – How you can still make ketogenic rolls! There are recipes on their YouTube channel with modified recipes. [33:36] – Talking about MCT oil – with different brands are they achieving what we want them to and are there things we need to watch out for when looking to purchase different MCT oils? At Matthew’s Friends, the MCT oils are prescription products because they are dealing with medical patients. Emma gives some advice around taking these as taking too much can cause gastric side-effects so should be used with caution. available on prescription listing. Emma talks about ensuring the safety of products used for patents with vulnerable conditions. Only products that are on the prescribed list are used so it’s exciting to see these new things coming up. [36:26] – Children do a blood or urine ketone test twice a day during the first three months. Once things are stabilised this is reduced to testing once a week. [37:57] – In terms of age, because Matthew’s Friends is an out-patient facility, patients need to be at least a year old to be treated. Younger infants need to be in-patients and are advised hospital treatment. issues? Emma explains children can be weaned off the diet after two years. Using the diet for two years does its job, seizures stop. It doesn’t have to be a lifelong diet for epilepsy. ingredients in the diet can be all natural & this can be seen as how to prevent seizures naturally, what they are doing is not ‘natural’ because the metabolism is being forcibly switched from glucose to fats. The body can survive on this switch without a problem, but it’s a generally a backup, and we are forcibly doing it for a long period of time so there are side-effects. [42:25] – Long-term side-effects in children include issues with growth; while on the diet growth slows down and catches up again when children are taken off the diet – children might end up a cm or two shorter. There is a possibility of bone weakness which is being looked at (medication can also cause this). Short-term, constipation is common as well as gut problems. [44:20] – Are there cardiovascular concerns around consuming so much fat? Emma recommends reading the Gary Taubes books on Amazon and looking up other experts such as Dr. David Diamond, who gave a presentation explaining that there is no medical clinical evidence supporting fat giving you chronic heart disease. It is only in combination with carbs that it leads to weight gain. [46:06] – Understanding that when we remove carbs, fat is used for energy and not being stored. Dietitians perform regular blood tests to ensure that everything is medically safe. Cholesterol tends to go up initially and then comes down again. Dave Feldman also talks more about this in his podcast interview. [48:10] – What are studies that look at long term effect of ketogenic diet on cardiovascular health of these children showing? From what we know at the moment it seems that for most people the cholesterol levels return to normal after the initial spike causing no long-term issues. [49:11] – Even though it is only necessary to be on the ketogenic diet for two years to see improvement, should patients adapt a more low carb type diet going forward? While Matthew can now have what he wants – except rice which is mysteriously still a trigger for him – Emma is still careful about the amount of sugar he eats. [51:36] – Emma explains that patients have to come off the diet slowly to give the body time to adjust and how this gives people time to see if anything will be a trigger for them. Some people remain on the low carb diet and are more careful, while others just go back to eating whatever they want. [54:51] – Amazing benefit of simply adjusting one’s diet in helping patients minimise the amount of epilepsy medication (which is strong and has many side-effects) they need to take. Advice on how even people who are well controlled on their medication can benefit and feel better. [56:06] – How patients are enquiring about dementia, Alzheimer’s etc. Because Matthew’s Friends is a charity they need to fundraise for everything they do, so in a lot of cases it does come down to money. There is a need for a bigger clinic and more staff to be able to support the case studies. Emma explains that Matthew’s Friends sole focus is the medical ketogenic diet and how it can help people suffering from chronic diseases. [57:33] – Empowering families and reaching out to every family making the diets as practical as possible and accessible to everyone. There is a 365-day support line available for people needing support. [58:35] – To find out more, contact the website matthewsfriends.org. Also check out their Twitter, Facebook, YouTube & Instagram accounts.